Recent satellite imagery shows that the Aral Sea continues to disappear. What was once one of Central Asia’s most recognizable geographic features and a great regional geo-economic asset may no longer appear on future maps. Satellite imagery made available by NASA shows that a vast majority of the Aral Sea — once the world’s fourth largest inland sea — has dried up. Going by current trends, the Aral Sea, with the exception of a small portion in the north, may disappear altogether. The images, released from NASA’s Terra satellite highlights the decay of what was once a distinct feature of Central Asia’s geography. They catalogue the lake’s gradual and dramatic reduction in size since 2000. The drying up of the Aral Sea was described by U.N. Secretary-General Ban Ki-moon as “one of the planet’s worst environmental disasters” in 2010. The Aral Sea, which is actually classified as a lake, has been steadily shrinking since the 1960s following Soviet irrigation efforts. The lake, which lies between Uzbekistan and Kazakhstan, began suffering its current fate due to a Soviet-era economic plan that sought to irrigate the nearby desert in Uzbekistan to prompt greater economic output. For a short time, Uzbekistan became the world’s largest exporter of cotton. This economic boom would not have been possible without the Soviet effort to divert water from the rivers that fed the Aral Sea — the Amu Darya and the Syr Darya. As a result of that human intervention beginning in the 1960s, the lake began to slowly recede. By 2007, the Aral Sea had shrunk to 10 percent of its original size. According to NASA, this precipitated a broader economic and environmental crisis. The increasingly salty water became polluted with fertilizer and pesticides. The blowing dust from the exposed lakebed, contaminated with agricultural chemicals, became a public health hazard. The salty dust blew off the lakebed and settled onto fields, degrading the soil. Croplands had to be flushed with larger and larger volumes of river water. The loss of the moderating influence of such a large body of water made winters colder and summers hotter and drier. Given the Aral Sea’s history of use and misuse, the region’s residents are prone to several diseases including tuberculosis, typhus, hepatitis, cancer, and lung disease. Additionally, the Aral Sea basin area has the highest child mortality rate in the entire former Soviet Union. In 2005, in an effort to save the northern portion of the once large sea, Kazakhstan built a dam which saved the northern portion of the lake at the expense of the south. As the Aral Sea dried up, it split into two discrete lakes: the northern Aral Sea and the Southern Aral Sea. 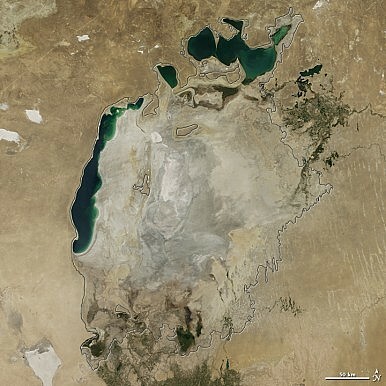 The Kazakh dam isolated the two waters physically, leaving the Uzbek-facing Southern Aral Sea in a state of peril. Today, the water that flows from Syr Darya — one of the original feeder rivers to the Aral Sea — ends up in the Northern Aral Sea. Kazakhstan’s efforts ended up paying off. According to NASA, water levels rebounded in the Northern Aral Sea between 2005 and 2006 and that lake remains far more stable than the Southern Aral Sea, which today exists as a narrow sliver, on the cusp of disappearing altogether. Uzbekistan still uses water from Amu Darya to maintain its competitiveness in the global cotton industry, effectively leaving the Soviet immigration efforts of the 1960s as a permanent modification of Central Asia’s resource geography. NASA has a satellite imagery timelapse available on its website that reveals just how dramatically the Aral Sea is disappearing. 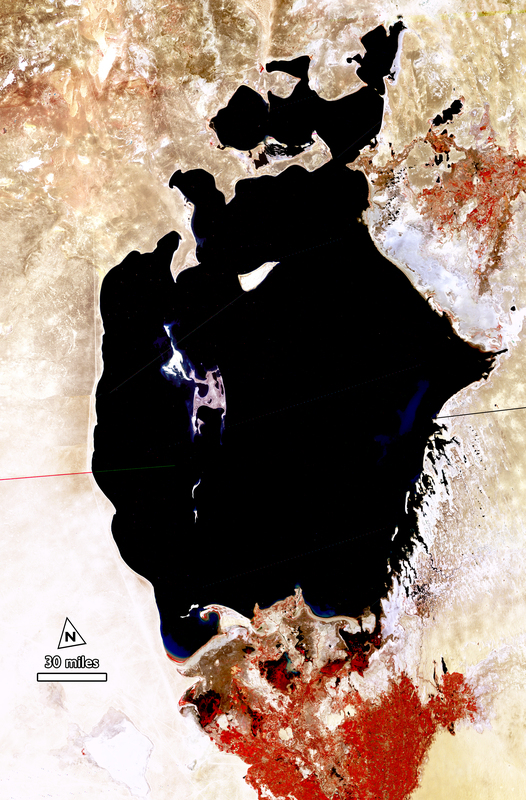 The images on NASA’s feature go back to 2000 when the lake was already considerably receded, but for context, it’s worth looking at this satellite image from 1977 showing just how vast the Aral Sea used to be. China’s Belt and Road Gets a Central Asian BoostWhat is Life in the Aralkum Like?Central Asia's Environmental SinsUzbekistan: It's Time Look Beyond Repression or RadicalismAfter Returning Home, What Awaits Kyrgyz Labor Migrants?